The Big South Fork National River & Recreation Area encompasses 125,000 acres in Scott County, Tennessee, as well as Fentress, Morgan and Pickett counties in Tennessee and McCreary County, Kentucky. Managed by the National Park Service, the Big South Fork NRRA includes the lands surrounding the Big South Fork of the Cumberland River and its major tributaries. The Big South Fork is recognized as one of the Southeast’s top destination for whitewater paddlers, and the park itself is among the top destinations in the eastern U.S. for equestrian riders. Hiking, rappelling, camping, fishing and hunting are other activities enjoyed at the Big South Fork. The geological makeup of the park is among the most unique east of the Mississippi River. Several rock chimneys and natural arches (including the largest natural arches in North America), dozens of waterfalls and more than a hundred rock houses define the geology of the park. Wildlife inhabiting the park range from whitetail deer and wild turkey to black bear and a wide variety of smaller game. 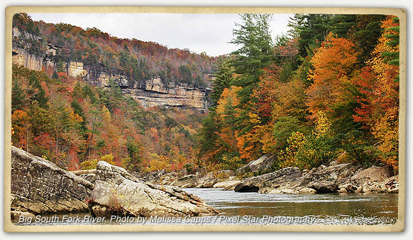 The Big South Fork NRRA hosts several events throughout the year. Two festivals stand out: the Spring Planting Festival each April and the Haunting in the Hills storytelling festival each September. Supplies: Maps, permits and other necessities are available at the Bandy Creek Visitors Center. Camping: Campgrounds with water and electric hookups are available at Bandy Creek and the Station Camp equestrian campground. Rustic backcountry camping is permitted anywhere in the park (except parking lots and trailheads). A permit is required. Lodging: The backcountry Charit Creek Lodge offers bunkhouse-style lodging or cabin rentals for larger parties. Several cabin retreats and motels are available outside the park. Dining: A variety of restaurants welcome diners in Oneida and Huntsville.